Black Bottle was relaunched in 2013 by Burn Stewart Distillers. They decided to change its nature – the old version (which was revitalised in 1990) was a blend of almost every Islay malt whisky and grains from different regions. This new bottling of Black Bottle Blended Scotch whisky is a fruitier version with most of its malt coming from Bunnahabhain distillery (Islay expression known for non peated whiskies). They claim that the change in direction is a return to Black Bottle’s past. That the whisky was made more like this, back in 1879. This is probably true but fans of the 90’s version are not happy about the “new” direction. 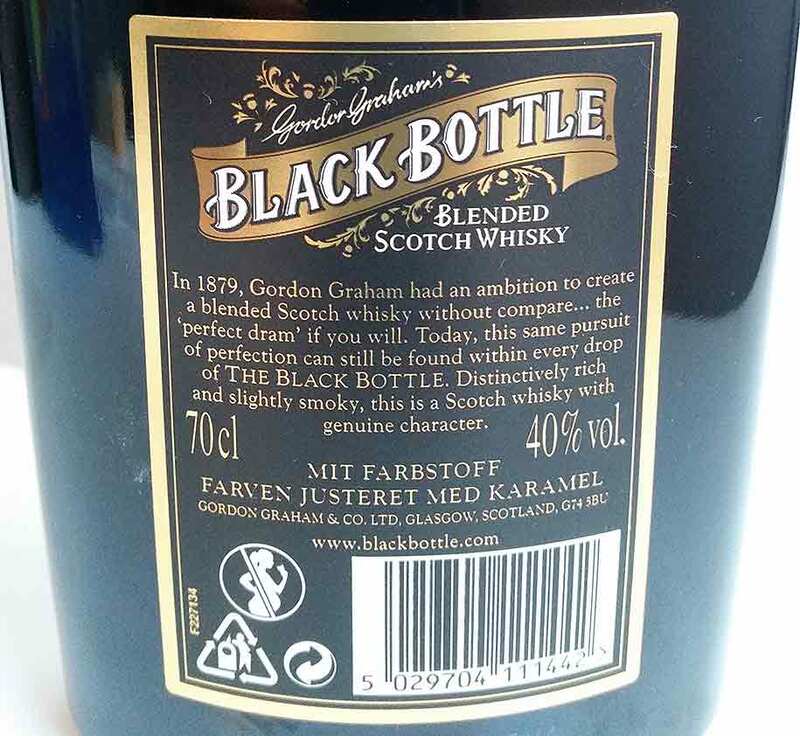 One thing is sure, this newest bottling introduces the old-style black glass bottle, which originally gave Black Bottle whisky its name. The name came from a German-made black glass, which disappeared during the Great War. So there is lot of irony in this brand: the expression is nowadays (and probably in the past) lighter while the bottle is black, from 1990’s until 2013 the expression was stronger but the glass was lighter (green). The irony of the literally Black Bottle without dark content is so big, it’s like a white guy trying to be black so hard. Like Woody Harrelson’s character Billy Hoyle (aka Billy Ho!) in Ron Shelton’s movie White Men Can’t Jump. Like Billy, Black Bottle is actually quite good, just in a different way. Like the previous Black Bottle, this stuff is good of its kind – blended whisky. The touch of grains is present in a bad way, but fortunately the malt along with oak, brings good flavors to the palate. Nose: Hints of ashy smoke, some apples and toffee, lots of sherry influence. Hints of salty licorice, malt and cinnamon. The best part of this blended whisky. Taste: Sugary and dark – hints of bitter citrus notes. Peppery with mellow grapefruit notes. Finish: The grains take over in the aftertaste – fortunately, in this case, the finish is quite quick and flat. There’s grains forming a grapefruit feel again, with sherry influence and wee spices but I couldn’t detect much more. Balance: All in all, the balance is fairly good and the quality level of this whisky is just as high as the old bottling had, when comparing it to other cheap blends. The malt influence is strong, as it was in the old peated version. It’s just a matter of taste, which one you prefer more – as a “peathead” I fancy the old bottling more. But this is just as much “bang for the buck” whisky.